Wheres the Graphmate Serial #? Purchased, downloaded, installed Graphmate, NO SERIAL #? I looked through my available serial numbers numerous times. There has already been a thread about this problem. A support ticket has been raised, and we are waiting to hear from them. Thanks for the heads up, got fueled and didn't check first. You should have your serial number. Go_Figure: Do you need to manually generate serial numbers? I purchased Keymate on 12/11/2012, Order #100433933 and I don't have a Keymate serial number in my account on the two pages of serial numbers I have available to me. I submitted a DAZ ticket 121549 on 12/15/2012 and am still on a holding pattern. Thanks for any assistance.. I will contact them. I know some have reported they got theirs, I assumed all had. I am told that it may be on the second page, if you have lots. The DAZ guy over there says he just fixed it. Thanks a bunch for contacting the DAZ guy! Keymate is the first one on my list of serials..
Greetings. I have purchased Graphmate and the serial number appears on my list. However the error message on the plugin page indicates that this is the serial number for the Evaluation version, and therefore no longer valid. Would it help for me to submit a ticket to DAZ as well? The same situation applies for Keymate. Did you copy and paste your serial number in like in this image(except using your serial numbers)? I am using the Mac 64-bit version. Does that make a difference? 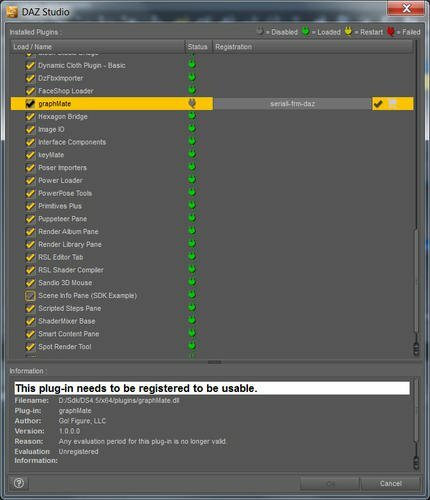 Later today I will try registering this plugin on my Windows computer and see if I have success there. Should not make a difference. I wonder if you got an invalid one somehow. Try on your windows machine and then you will probably need to contact DAZ support. The GraphMate and KeyMate serial work for me now that I have installed Apple's updates on my Mac.